RIT faculty Manuela Campanelli, left, Callie Babbitt and Kara Maki discussed strategies for increasing recognition of academic work as part of a professional development panel sponsored by AdvanceRIT. Nearly 20 female faculty from across campus and at varied stages of their careers “leaned in” this past week for a panel discussion, “Daring Appreciation: Strategies for Increasing Recognition of Your Work.” The event was part of the Connectivity Series, a professional development initiative launched this spring by the AdvanceRIT program, a campus-wide study to decrease institutional barriers to female faculty’s career progression. The focus of the panel on recognition was based on how rewards and recognition play a part in securing tenure, broadening research initiatives and contacts, and in opening doors to academic service and leadership opportunities as well as promotion. 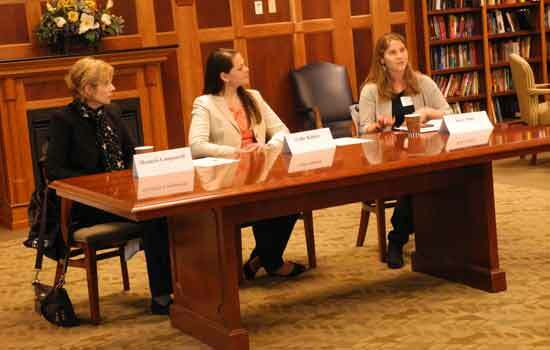 Panelists were three of the campus’ accomplished female faculty-researchers. They provided strategies about building toward successful recognition including: actively seeking out public forums to discuss work, both on and off campus; relating with senior faculty and campus leadership; developing mentor relationships; and promoting the work of other women, including nominating female peers, or self-nominating for high profile campus awards, committees and leadership positions. Over a five-year period, from 2007 to 2012, the percentage of RIT campus-based, academic awards received by female faculty was slightly more than 12 percent, according to new research by AdvanceRIT into results of the faculty award process at the university. In this study, the gender distribution of university awards is proposed as an indicator of progress toward achieving parity for female faculty. Panelists Callie Babbitt, Manuela Campanelli and Kara Maki, all RIT distinguished faculty, have been among that small percentage of female faculty recognized for both effective teaching and influential research. They talked about balancing strategic, purposeful conversations and activities with more personal approaches that allow female faculty to be seen as accomplished as their male counterparts. Babbitt, assistant professor in RIT’s Golisano Institute for Sustainability, recommended women seek out opportunities to become recognized as subject matter experts by responding to media requests, presenting regularly at conferences, speaking at community events and collaborating on interdisciplinary projects. To her, it is a way to advance information about her field of sustainability and to support efforts of women in STEM fields. Campanelli agreed, and added that being visible allows for different conversations with peers, and seeking out or becoming a mentor. Early in her career, the professor and director of RIT’s Center for Computational Relativity and Gravitation had a mentor who was strong in her field and who gave good advice about the sometimes puzzling and lengthy process of looking into, and applying for, research grant opportunities. Confidence in their abilities, a desire to learn as well as teach, and an understanding that they must support each other was also key to career advancement for the panelists. But it also meant advocating for other women, and “talking about each other’s work,” said Campanelli. Connectivity Series programming will continue discussions about that work and other professional development strategies for faculty. More information about the series can be found on the AdvanceRIT website, or by contacting the series coordinators, Sharon Mason, associate professor, information sciences and technology, and Carol Marchetti, associate professor, mathematical sciences. The AdvanceRIT team’s new research, titled “Faculty Awards at a Large Private Institution: An Indicator of Evolving University Values,” will be presented at the 2014 American Society of Engineering Education annual conference scheduled for this June.